These are adapted from a recipe that we had one evening at Pappasito’s, a Mexican restaurant in the Houston area. 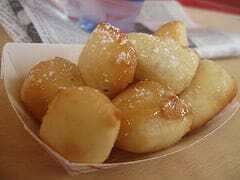 Pappasitos used to serve up these mini sopapillas, you can make them at home. In mixing bowl place Harina flour mix and milk. Stir until dough forms a ball. Cover with plastic wrap and let rest in mixing bowl for 30 minutes. Mix sugar and cinnamon together and set aside. Divide dough in half and dust area with 1/8 cup of all purpose flour for rolling out the dough. Roll out dough to 1/ 8" thickness and cut into 1" x 2 1/2" strips. Cover strips with plastic wrap and let rest for 20 minutes. Heat vegetable oil for deep-frying. Oil should be deep enough so the strips may be submerged and not touching the bottom of the fryer. When strips are ready to fry, submerge them in hot oil and cook until they are lightly golden. Remove from oil and place on paper towels so the excess oil may drain off. While the sopapillas are still warm generously sprinkle them with the sugar and cinnamon mixture. When serving, honey may be generously drizzled on top Harina flour is available in the pantry section of your grocery store. Photo by Sweetsauce. I am glad to hear that you enjoyed these! !